Fresh and delicious Summer Corn Salad is sure to be a hit at your BBQ, Pool Party, or Summer Grilling Get-Together! When Brooks and I first got married, I made a salsa that I thought was pretty good. Of course, my husband had to try to one-up me and made a black bean and corn salsa. It was really a corn salad but that is not the important part of this story. He did do a better job than me in that more people ate his corn salad than my salsa!! I’ll say that it was heartier, more filling, and was like a side dish than a condiment. I have since given up on my salsa (not that I am admitting defeat because the corn salsa is still the front runner.) I am focusing on other salads like my Southwest Sweet Potato Salad and my Mediterranean Salad Stacks. They are super cool! Now we make it together because one of us always leaves out one ingredient because we refuse to write it down. I do have to say that we make a great team because the other person always remembers the missing item. Another reason we are a great team is because he is always honest in his opinion of my food when I make something, and vice-versa. When he tells me something is not that good or could be better by doing ____, I still tell him he’s crazy. Then he reminds me of the corn salad and how I came in second. I will admit it still burns me up inside a bit. The last time we made this corn salad, TOGETHER, we decided to finally write down the ingredients. Here it is, without forgetting that one ingredient! Tip for cooking fresh corn! 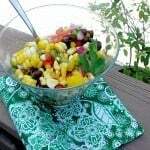 Summer is a great time to make summer corn salad as all the ingredients can be found at your local farmer’s market, ripe and delicious! 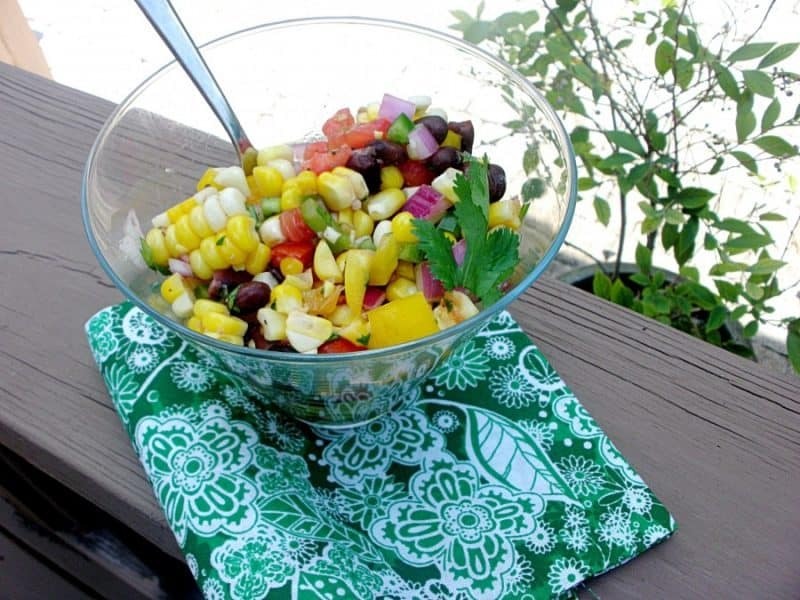 Enjoy this summer corn salad as a side dish, a salsa, or as a compliment to many different types of meats and seafood. I like it with grilled shrimp or chicken! This corn salad is bright and zesty with black beans and jalapeno. Perfect for any BBQ! Mix all the ingredients together except the salt and pepper. Add the salt and pepper to your liking and toss well. Chill for at least 30 minutes to let the flavors meld. It’s always better the next day! It’s important to taste it before you season it. I like things salty, but my husband does not and we always argue over the salt content. I’m a big fan of corn salad. This version sounds delicious. Thanks for the tip on microwaving the corn. That’s going to save me so much time. So delicious.Thanks for your nice recipe. There is no doubt about the taste or flavour but it’s super healthy, very colourful. I’m gonna this recipe on weekend for family and friends. thanks for sharing it. Thanks so much!! I hope you like it! Being from the Midwest, anything involving corn i am usually in for! This is one of those times. Great looking salad. This looks SO refreshing!! I bet it would be super delicious over a salad! I love corn salsa and I definitely need to try this! 🙂 I love the story behind this salsa! My husband feels that his fudge is better than mine… but we haven’t had a cook off yet! This post gave me an idea to do a cook off with him!